Civil War ghost story of artifact collector has a ghostly encounter with one of the Confederacy’s most famous spies. Written by Craig Dominey with Scott Dupoy. One warm spring day, I left my home in Washington, D.C. and took a long drive through the rolling, peaceful farm country in Virginia’s Shenandoah Valley. I worked in the city as a tax accountant, but most of my co-workers didn’t know about my secret hobby – I was a Civil War collector. Ever since I was a child, I had collected old Civil War books, maps, clothing, and in later years, weapons. Now as a middle-aged man, my interest had grown to what some would call an obsession. Although it’s hard to believe today, this peaceful Virginia valley was the scene of some of the bloodiest battles of the war. Driving through this historic land not only satisfied my hunger for history, but calmed my nerves far away from the hustle and bustle of home. Some folks say that ghosts wander the earth in places where horrible deaths took place, their lives suddenly ripped away from them before they knew what happened. So it’s no wonder that so many Civil War ghost stories come from the Shenandoah Valley. But the human tragedy of the war didn’t weigh heavily on my heart at that time. Although I knew that many young men had lost their lives, the war to me was a fascinating chess game of strategies, maps, attacks and counter-attacks. So while I found these ghost stories intriguing, my interest was in studying battlefields, not myths and tall tales. That is, until I met the mysterious woman on the roadside. I was so carried away with my travels that day that I stayed in the valley until nightfall. I gazed with wonderment at the bright, full moon overhead. The winding road suddenly plunged into a long, dense stretch of woods, and if it wasn’t for that bright moon, I certainly would have been swallowed up in the black darkness. A few miles into the woods, the moonlight faintly revealed a figure running beside the road in the distance. At first I thought it was a runner getting a bit of exercise for the night. But as I drove closer, I was surprised to see that it was a young woman, dressed not in jogging clothes, but in a long, dark blue dress with a white apron hanging over it. The dress looked like something women wore in another time – the 1800s, I guessed. Her hair was pulled back tightly from her strikingly beautiful face – a face that I noticed wasn’t flushed from her run, but was as white as snow.She was obviously in a great hurry, running swiftly beside my car, oblivious to my presence. Since we were miles from any town, I pulled over and asked if she needed any help. “Why yes,” she answered breathlessly, jumping into the passenger’s seat. “I’m on my way to meet some friends, and find myself in need of some quick transport.” She seemed excited and a bit nervous as she immediately looked behind her, as if she was afraid someone was following. I slammed on the brakes and aimed my car down the long, bumpy dirt road. 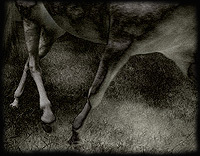 It was then that I heard a strange and unbelievable sound – horses, lots of them. From what I could tell, they were galloping up rapidly behind me!I looked into the rear view mirror, and I saw a sight that chilled me to the bone. I was being followed by a dozen horsemen, all in military uniform, armed and shooting directly at us! My palms started to sweat. I stepped on the gas, but as fast as my car was, the soldiers on horseback lost no ground. “Can’t you go any faster?” the woman said, her voice calm but her bright eyes shining excitedly in the moonlight. I could hear the bullets whizzing close by the car windows. One of the riders got close enough to the car that I could finally see what he looked like. I could swear that he wore a Union Civil War uniform, blue and slightly tattered. His skin was pale, and not just because of the moonlight. As he rode closer to my window, I could see the trees in the forest right through him, as if he were a patch of mist! Seeing me, he pulled out a pistol and aimed straight for my head. I let out a yell and made a sudden turn onto another side road as he fired, the bullet whizzing past. I was really starting to panic now – what in the world had I gotten myself into? The woman suddenly spoke up again: “Over there! That’s where my friends are!” I looked where she was pointing, and saw several campfires burning deep in the forest. I drove as fast as I could toward the fires. If these people are her friends, I thought, maybe they can get us all out of this mess. Suddenly a loud bang erupted from underneath the car – my tire had blown! I swerved off the road and sideswiped a tree. As the car sputtered to a halt, the mysterious woman looked over at me with an expression not of fear, but of annoyance, as if our death-defying chase was a nuisance to her. “Thank you for your kind assistance, sir, but I think I’m better off on foot,” she said. Then she jumped out of the car and ran as fast as she could toward the campfires. The soldiers on horseback rode past me without even a glance in my direction, chasing her into the forest. As the woman gradually faded from sight, so did the horsemen and the campfires. Then, just as suddenly as they had arrived, they were gone. Only the silent, black forest and the bright moon remained. I sat in my car in stunned silence for the remainder of the night, scared to make any move for fear of the ghostly soldiers returning. When the sun rose the next morning, I saw no sign in the forest of any fires or people. There were no foot or horse prints anywhere to be found. Was it all a dream? An hour later, a tow truck driver arrived to take away my banged up car. He was quite curious as to why I was stuck so far out in the woods. I was so delirious at that point that I went ahead and told him the story, figuring he would at least have a funny tale to tell his friends after work. To my surprise, he got strangely quiet and nodded. After my experience, I never returned to that part of Virginia – at least at night. I became fully convinced that my ghostly passenger was the famous Belle Boyd. And sometimes at night, I think about Belle and hope she has delivered her last message to the Confederate troops in the forest. Perhaps then she can finally find peace. >Where Did The Story Come From? The Belle Boyd House 39.459557, -77.961341 Stories: Belle BoydFamily home of Belle Boyd (1844-1900), also known as \"Le Belle Rebelle,\" one of the most beloved Confederate spies during the Civil War. Now the location of the Berkeley County Museum. I love the way this story is written. The vivid descriptions of the moonlit night and the landscape. It’s like reading an ancient Korean folktale. oh yes also poor Belle Boyd im from the North and Slavery is totally wrong!!!!!!! Creepy!And there probably is a ghost of this person.Um,wow. @M.G.G. I’m sure you would love to know that, at it’s height, New York had more slaves per capita than any state in the union. This is not true my great-great-great-great-great-great-great-great-great-great-great-great grandmother has never seen such thing called a car.